Procraftination: I'm officially a Dynamo! I can finally share some news with you. 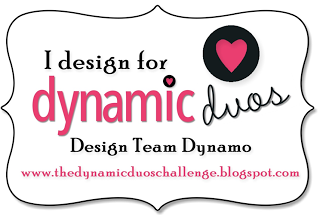 I've been chosen to join the very talented design team at the Dynamic Duos Challenge blog. Getting that "Welcome" email from Lesley Croghan was SO exciting! Dynamic Duos is a weekly, 2 color challenge. I hope you'll be inspired to play along with us! You'll find links below, to visit all of the DT Dynamos. Hope to see you playing along with us. There are some great color combos coming up!